Ouch! Which ground-dweller is stinging me?! Dylan dragged the lawnmower from the garage and started it up. He hated wasting Saturday morning mowing, but at least he could lose himself in thoughts of Krystal and their date tonight. He was halfway across the lawn, lost in his dreams, when he was startled by a burning pain on his bare ankle. Then another. “What the hell!” He swatted something from his leg. But quickly there were more .. and now they were everywhere, stinging his legs and arms, climbing dangerously high towards his shorts. He killed the mower, flailing his arms as the angry insects swarmed around him. He had run over a nest of …. …..what? Bees? Wasps? Hornets? Got any idea? This week on Friday Fiction..the who’s who of stinging insects — a simplified guide. There are many kinds of bees, but the most common are honey bees (Apis mellifera) and bumblebees (Bombus spp.). There are over two dozen species of bumblebees and seven kinds of honey bee. Bees’ thoraxes (“shoulders”) are usually covered in fine hair that gives them a fuzzy appearance. They are more ovoid or cylindrical in shape, appearing stockier than wasps. When they fly, their legs are normally not visible. When bees forage, you can often see pollen baskets on their rear legs. Many bees have alternating black and yellow (or white) stripes. The job of a field bee or forager, is to gather nectar, pollen and water for the young. This means you will most likely find them on flowers. They are much more interested in their work than they are in you so a foraging bee will give you a great opportunity to view it up close. They also have little or no interest in human food, so generally won’t bother you at a picnic or harass the kids when they’re outdoors eating popsicles or watermelon. You may, however, encounter a beehive. 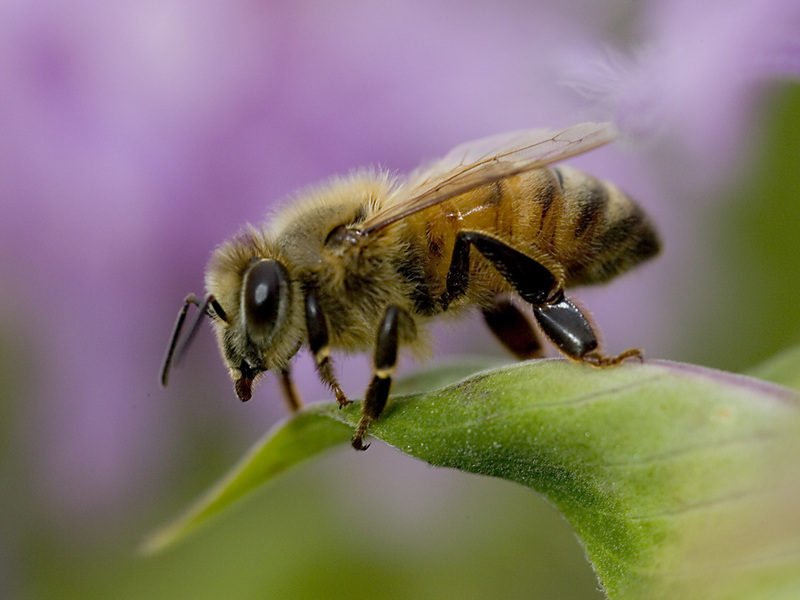 Honey bees are eusocial insects so they live in large complex colonies. The colony usually builds its hive in a vertical space like a hollow tree or inside the exterior walls of a building. Swarming honeybees are generally not aggressive. Just leave them alone and they’ll move on. (TN Dept of Ag.) . You may also encounter a honey bee swarm. When a colony becomes overcrowded, a queen and hundreds, maybe thousands of workers leave in search of a site to build a new hive. 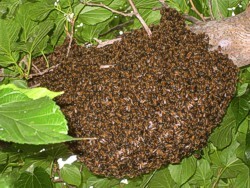 This usually happens in the spring and, while swarms look scary, the bees are seldom aggressive during their move. Bumblebees do not form large colonies like honeybees but do build small nests to house a queen and some worker bees. Bumblebees will use abandoned rodent burrows, old mattresses, compost heaps, or abandoned vehicles –anywhere they can find insulating debris to use for nest construction. It is rare for a person to come across a bumblebee nest. The most important thing to a bee is its hive or nest. This is where its future lies, so bees will take a strong defensive stand against invaders. Approaching a bee hive too aggressively or accidentally breaking one open, will certainly result in stings. Beekeepers know to move slowly and calmly, avoid swatting, and not to breathe directly on bees as CO2 may trigger an attack. Other than that, honey bees are seldom aggressive. This may be related to the fact that a bee can only sting once, then it dies. So there is good reason to sting only when absolutely necessary. When foraging, a bee’s focus is on its work. During swarming, with only the food in their stomachs to fuel them, they are in a race against time to start a new colony. That, and the fact that they have no hive to defend, means swarming honey bees will be very reluctant to expend energy on unnecessary aggression. Bumblebees are also relatively docile. They don’t swarm, but sometimes males will buzz around a nest site waiting for a chance to mate with the queen. These males cannot sting, so are harmless. In short, if you leave bees alone, they’ll leave you alone. 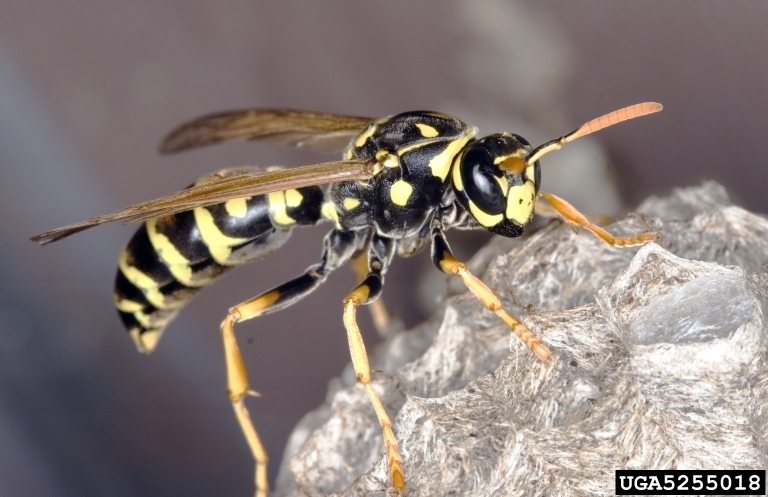 Wasps include yellow jackets and bald-faced “hornets” which are not true hornets. 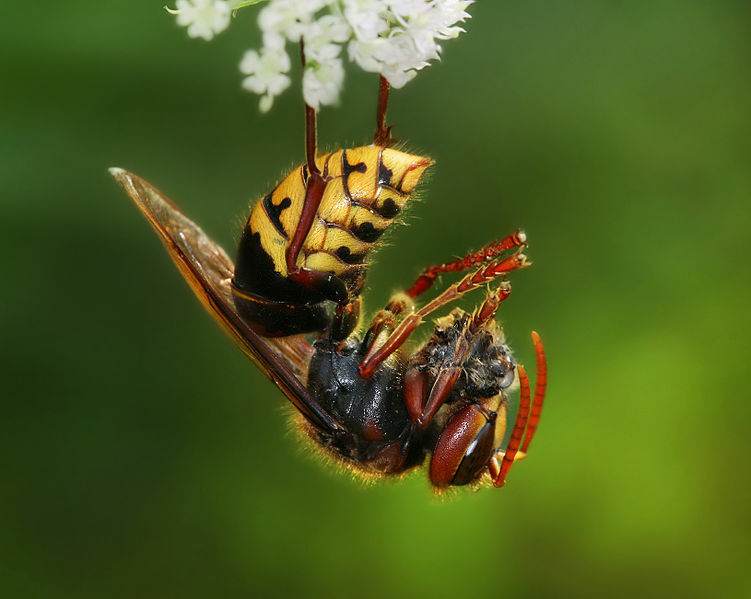 In fact, there are no native hornets in North America, only the large European Hornet which is now found across a large portion of the eastern US. As opposed to their fuzzy round cousins, wasps are hairless, shiny, and often have long slim bodies and narrow waists. The exception to that is the yellowjacket, which on first glance, resembles a honey bee in coloring and shape. Wasps tend to have long legs that dangle when they fly and they do not have pollen baskets on their legs. Cicada Killer Wasp (or Cicada Hawk) Sphecius speciosus. A solitary hunter that nests, 1 per hole, in the ground. Only females can sting. Wasps are predators and/or scavengers. Many wasps, including bald-faced hornets, prey on other insects and spiders. You will seldom find them on flowers and they won’t generally be attracted to human food or activity. The exception to that are yellowjackets, which are also voracious scavengers, attracted to sweet or decaying protein-rich food. These are the buzzing creatures that you find swarming around garbage bins at picnic sites or hassling children over popsicles in the back yard. 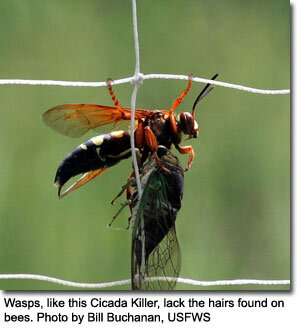 Parasitic wasps (those that lay eggs in or on other insects) and solitary hunting wasps, pose little threat to humans. They don’t gather in large groups or defend communal nests. Some, like the mud-daubers, build nests that hold individual eggs, but don’t house adults so stinging incidents are rare from such wasps. But yellowjackets and bald-faced hornets are social, like honey bees. Bald-faced hornet nests are the large football shaped paper nests that most people recognize. 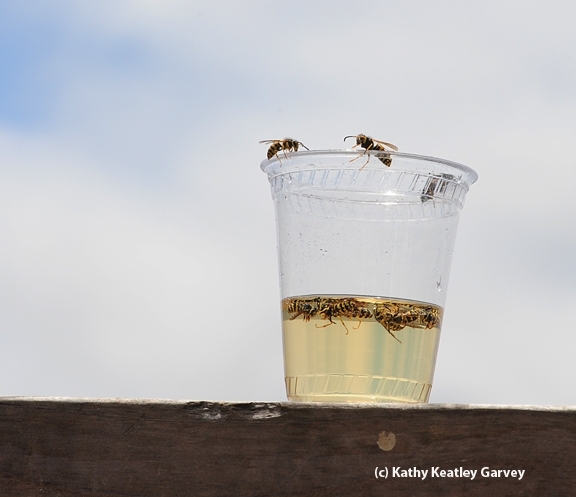 Avoiding stings from these wasps is as easy as avoiding the usually obvious nest. Away from the nest, bald-faced hornets are rarely aggressive or even accessible, intent, as they are, on hunting insect prey. Yellowjackets, however, pose a larger problem. 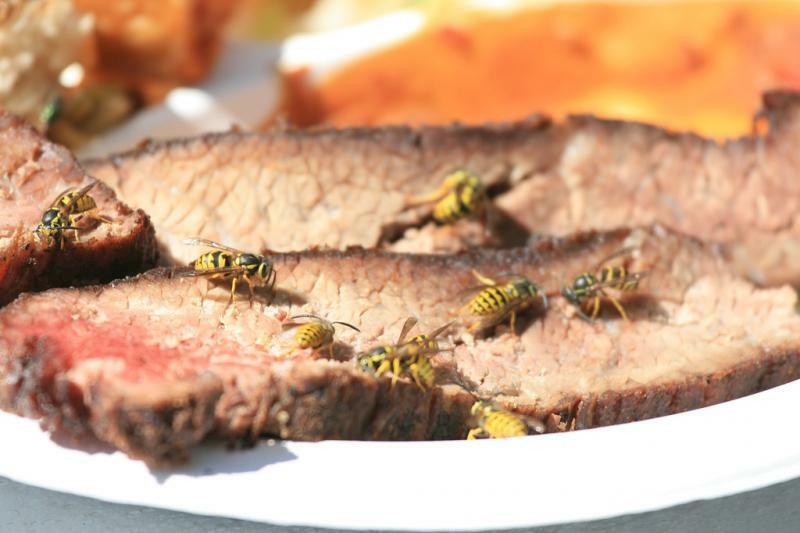 First, their invasive presence at picnics virtually ensures that someone is going to get stung, either by swatting at them, sitting or stepping on one, or accidentally ingesting one. These are the creatures that find their way into cans of Coke, open drinks, or onto a burger, eventually ending up in someone’s mouth. Their nests also pose a danger. 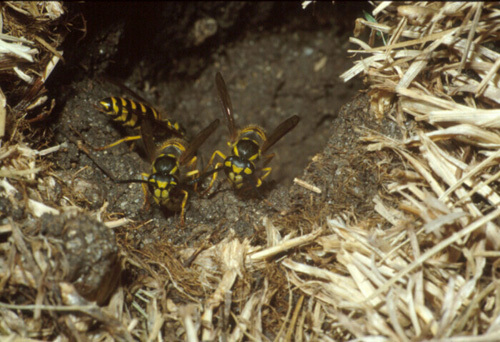 Like the bald-faced hornets, yellowjackets construct paper nests, but in concealed areas– often below ground in abandoned rodent burrows, in the hollow pipes of playground equipment, or behind walls — places where people will undoubtedly run into them. And like the bees, defending the nest is paramount. This non-native species is easily recognizable by its size. The largest of all the stinging insects, the hornets, with their yellow and black stripes, resemble yellowjackets, but at an inch long, are more than double their size. But size doesn’t equate to aggressiveness. In fact, European hornets are notoriously shy, even backing up when approached by humans trying to swipe them out the kitchen window. Yes, they will defend their paper nest — often located inside hollows or walls at least 2 meters above ground — if actively provoked, but are largely tolerant of passersby and quiet observers. They are more aggressive in defending their food however. Hornets prey on other flying insects and on fruit. Disturbing them while they are killing or feeding can result in stings. Fortunately, despite legend to the contrary — “Three stings and you die” — the stings of European hornets are no more painful or dangerous than any other wasp or bee. So now you know, Dylan’s (or anyone’s) “bee sting” story that begins with, “I was mowing the lawn and …” tells you they probably encountered a nest of yellowjackets. You’ve left out the Africanized bees that are extremely aggressive and can swarm and kill humans just from the multitude of stings. They’re far too common in Arizona and do cause the occasional human death.